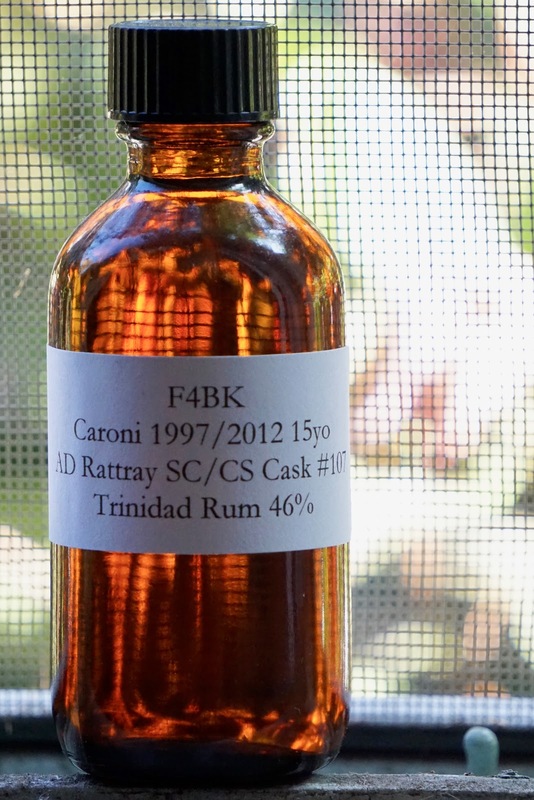 A. D. Rattray Caroni 15yo 1997 (46.0%): Random sample day... This one is filled from A. D. Rattray's 15 year old single cask Caroni bottling. The rum is distilled in 1997 and bottled in 2012. In case you didn't catch up with the Caroni hype yet the distillery is established in 1918 in Trinidad but unfortunately shut down in 2002... Their inventory got sold to various independent bottlers and it reached a cult status among rum enthusiasts right after different single cask expressions started to pop up on the shelves all over the world all of a sudden. Well, I am lucky to have this one on my desk today... The cask (#107) yielded 279 bottles in total. Color: Amber, dark copper with thick, oily and slow moving legs. Nose: Overripe baby bananas and dried chili mangoes. Burnt rice pudding, cinnamon dusting and brown sugar. Hot fresh caramel, vanilla bean scrapings and toasted oak. Melted butter and cheap maple syrup. Warming, sweet and syrupy... Adding a few drops of water. Although it makes the nose a little less interesting for my taste it sure makes it more approachable. Less spicy more fruity now. Palate: Burnt plastic... Fresh ginger, leather and inner tube. Spicy and bitter... Nutmeg, cloves and crushed red peppers. Rubber tubes... A few drops of water takes the bitter edge off quite a bit. Crystallized ginger and ginger beer. Tingling on the tongue... Red Twizzlers, and sour cherry juice. Finish: Long with candied orange peel and paprika. Overall: I have to admit that I didn't taste too many Caronis before but this one is pretty different than what I had before. It's less syrupy in texture, has a thinner mouthfeel (not in a bad way) and carries definitely less burnt sugar notes. It's hot, spicy and packed with every kind of ginger notes imaginable... It's a perfect sipper, would make a killer Dark 'N' Stormy (tastes like one already) and on top of everything very reasonably priced. I am finally starting to feel the hype about Caroni. I didn't have a single cask sourced from the distillery I didn't like till now... Thanks to Florin for the sample.